Nepali Times | The Brief » Blog Archive » Who is killing public enterprises? Who is killing public enterprises? When Finance Minister Ram Sharan Mahat presented the Annual Performance Review of the Public Enterprises (PEs)-2015 in the Parliament on 12 July and pointed out the staggering loss of state-owned ventures, many in the audience were asking: so what else is new? The fact that the PEs are making huge losses is no surprise. What is surprising is that they have been allowed to do so for so long. Ever year, the people hear it just before the Finance Minister’s budget speech and forget about it for another year. No government has ever tried to reform, privatise or dissolve the loss-making PEs, which have been bleeding the state coffer dry over the last two decades. In fiscal year 2014-15, the PEs’ accumulative loss rose to Rs 26.92 billion from the previous year’s Rs 20.61 billion. Only 18 of the total 37 PEs made net profits while 15 incurred losses. The status of 4 PEs was not included in the review report. Nepal Telecom, Civil Aviation Authority Nepal (CAAN) and some banks continue to make profits. But their achievement has always been eclipsed by huge losses incurred by other PEs. 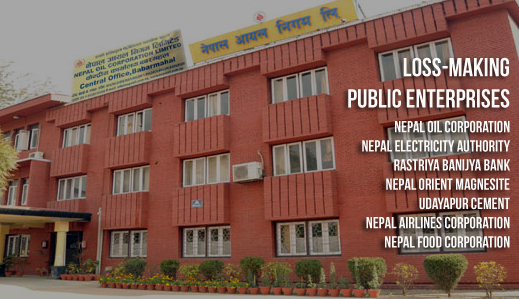 Nepal Oil Corporation (NOC) and Nepal Electricity Authority (NEA) top the list of losers. These two have accumulative losses at Rs 32.84 billion and Rs 17.94 billion respectively. Five other PEs have losses amounting to more than Rs 1 billion each. When PEs fail to make profits, the government has to provide loans – much of which is never paid back – to help them offset their losses. It could be justifiable to provide loans and subsidies to some loss-making but social service-oriented PEs like the National Food Corporation (NFC). But the government has been spending money from its state coffer to help some commercial PEs like the NOC, too. The PEB was formed to make recommendations for the overhaul of chronically-ill PEs. But it seems that setting up of the PEB was just an attempt by the government to show that it wants to reform the PEs. In 2012, the PEB submitted a report detailing what can be done to rescue loss-making PEs. Three years on, the report is gathering dust. “Reform is departure from what we have been doing all along,” says Wagle. “Our political leaders are happy with what they are getting from the chronically ill PEs. PEs are piggy banks for government officials. They all need to be dessolved. They never made any money and they will never make any money. Yes when all know what is wrong this is the corruption in journalism the collective silence! All loss making public enterprises need to be privatized. Any reasons for taxpayers to pay for inefficiency of loss making units? Have you ever seen chickens surviving under jackals’ vigilance? Are good numbers of them doing ok after privatisation?developing nations instead of selling public assets should make them profitable through selection of capable direction.